We’ve been thinking of putting this recipe up for a while and after our recent Pig Butchery Course there were a few requests so here it is. This is our Butchery Tutor Robin from the Rusty Pig favourite recipe and one that he uses for his amazing breakfast sausages. 5kg minced pork ideally from the shoulder and belly. This basic recipe allows you to play about with a little more freedom to experiment if you keep the meat to salt ratio the same when using dry spices then you will have perfectly seasoned bangers every time. However if you do decide to add flavours like mixed fruit, figs or even plums you may find that you need to add between 10 to 20g more salt. After mincing the pork add the salt and spices and mix well. Once everything is throughly combined fill your sausage stuffer and pipe into hog or sheep casings. 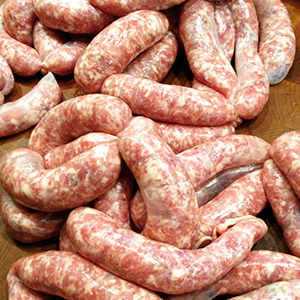 After linking your sausages, which is never as easy as you think, hang up to dry in a cool place for a few hours. Then you’re ready to heat up the frying pan and enjoy the fruits of your labour!